Today's Quarterly National Household Survey is a sobering reminder of just how far we still have to go to 'get back' to the way things were before the crash. Take, for example, the employment rate, i.e. 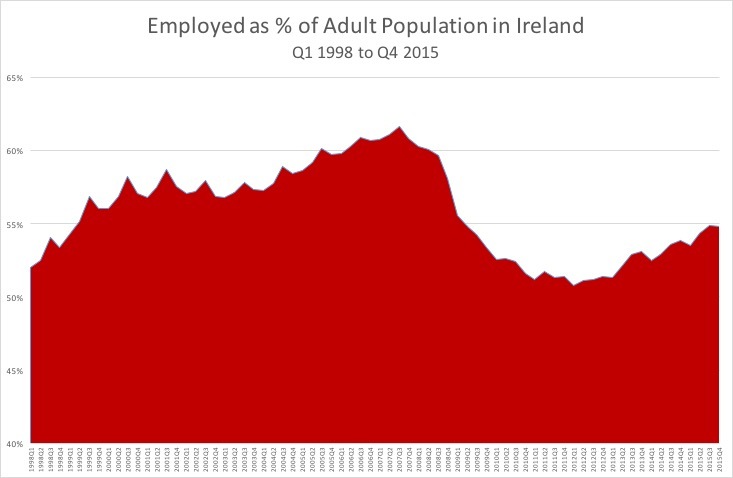 : the percentage of adults aged 15 and over in employment expressed as a percentage of the total adult population (the CSO excludes over 75s from the denominator, as is normal international practice, but I think they need to be included as there's going to be a lot more of them in future). The rate peaked at 62% in Q3 2007 before falling to just under 51% in Q1 2012. At the end of 2015 it had recovered to a little under 55%. Rising is better than falling, but at the present rate of recovery it will be 2022 before the employment rate returns to its 2007 peak. But it isn't going to happen. An ageing population - the denominator is going to get steadily bigger every year for the next 20, 30 or 40 years, especially among the over 70s population. The male employment rate (61% on my measure) is still ten percentage points below its 2007 peak and has been fairly static these past few years with little prospect of rising absent a recovery in the construction sector. Digital disruption, automation, AI, robotics - call it what you want but it's going to reduce employment significantly (7.1 million jobs lost between 2015 and 2020 according to a World Economic Forum report). Which all adds up to a very different future to that envisaged in some of the 'fantasy politics' debates about 'fiscal space' that we've been subjected to in recent weeks. General Election 2020 will be a lot more combustible than 2016, and fiscal space will be the least of our concerns.